The International Space Station's school bus-sized Harmony node (top) is moved into place at the front of the outpost's U.S. Destiny lab on Nov. 12, 2007. NASAengineers are tracking a potential, albeit minor, leak aboard the InternationalSpace Station (ISS), but do not consider it a concern for the orbital lab's astronautcrew or an upcoming shuttle launch, the agency said Wednesday. An inspectionof a vestibule bridging the station's new Harmonyconnecting module and NASA's Destiny laboratory indicated a slight air leakof about three pounds (1.3 kilograms) per day, NASA spokesperson Lynette Madison, of the agency's Johnson Space Center, told SPACE.com Wednesday. But whether the leak is genuineor merely a phantom signal has yet to be determined. A close-upinspection of the vestibule seal by the station's three-astronaut Expedition16 crew using an ultrasonic leak detector found no trace of a leak on Wednesday,Madison said. Studies of the station's overall internal pressurealso found no signs of decay, she added. 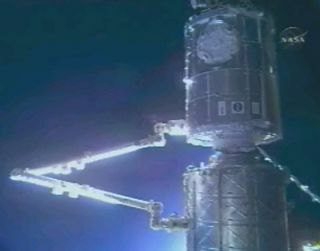 Engineersfirst recorded the potential leak during a "fine" check this week to ensureHarmony is properly connected to its Destiny docking port, Madison said. Aless sensitive, "gross" leak check performed earlier this monthyielded no issues, she added. "Nobodyis really concerned about this," Madison said. Engineersplan to check the seals between Harmony and its shuttle docking port for leakson Thursday, and may recheck the module's connection to the Destiny lab laterthis week, she added. Astronautsdelivered the school bus-sized Harmony node to the ISS in late October during NASA's STS-120shuttle flight. The station's Expedition 16 crew outfitted the module witha shuttle docking port earlier this month and performed three spacewalks in15 days to move the nearly 16-ton node to its final perch at the front ofDestiny. With itsmultiple berthing ports, Harmony is designed to serve as the anchor point for Europeanand Japanese laboratories beginning with the European Space Agency's Columbusmodule set to launch next week. NASA'sshuttle Atlantis and seven astronauts are slated to launch toward the ISS onDec. 6 to deliver Columbus and swap out one member of the station's Expedition16 crew. Top shuttle officials will meet Friday at NASA's Kennedy Space Centerin Cape Canaveral, Fla., to set a firm launch date for the planned11-day mission.